To investigate the in vivo femoral condyle motion and synergistic function of the ACL/PCL along the weight-bearing knee flexion. Twenty-two healthy human knees were imaged using a combined MRI and dual fluoroscopic imaging technique during a single-legged lunge (0°–120°). The medial and lateral femoral condyle translation and rotation (measured using geometric center axis-GCA), and the length changes of the ACL/PCL were analyzed at: low (0°–30°), mid-range (30°–90°) and high (90°–120°) flexion of the knee. At low flexion (0°–30°), the strains of the ACL and the posterior–medial bundle of the PCL decreased. The medial condyle showed anterior translation and lateral condyle posterior translation, accompanied with a sharp increase in external GCA rotation (internal tibial rotation). As the knee continued flexion in mid-range (30°–90°), both ACL and PCL were slack (with negative strain values). The medial condyle moved anteriorly before 60° of flexion and then posteriorly, accompanied with a slow increase of GCA rotation. As the knee flexed in high flexion (90°–120°), only the PCL had increasingly strains. Both medial and lateral condyles moved posteriorly with a rather constant GCA rotation. The ACL and PCL were shown to play a reciprocal and synergistic role during knee flexion. Mid-range reciprocal anterior–posterior femoral translation or laxity corresponds to minimal constraints of the ACL and PCL, and may represent a natural motion character of normal knees. 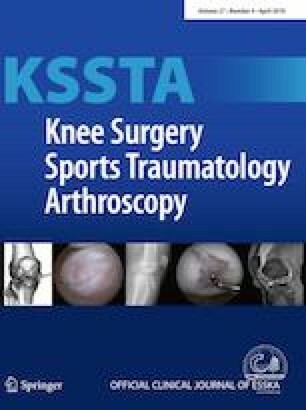 The data could be used as a valuable reference when managing the mid-range “instability” and enhancing high flexion capability of the knee after TKAs. We would like to gratefully acknowledge the financial support of the National Institute of Health (R01AR055612) and the Department of Orthopaedic Surgery at Newton-Wellesley Hospital. This study was approved by the institutional review board of the Massachusetts General Hospital (Partners Human Research Committees, protocol #: 2003P000337/PHS). Written consent was obtained from each subject prior to participating in this study.